Gail has sent a lovely review of her latest trip to Ladakh – see below for details. I set off to Ladakh with Mary Allen (Head of International Middle School – TSIMS) from Taunton International Middle School, Gillian Islip recently retired head teacher from Huish Episcopi junior school, and Laura Smith (Graduate Residential assistant – TSIMS) from Taunton International middle school. Both of the schools have supported Himalayan Children and fundraised with various events over the last year. ***UPDATE*** please click here to read Gill Islip’s lovely review of her trip to Ladakh. I wanted to show the teachers how Himalayan Children runs out in Ladakh. We met many children and families and visited 5 of our 13 schools to meet with the principals of each school. Time was limited, so we couldn’t get to see all the schools and children. We had a jam-packed itinerary! We visited, Shey Lamdon school where we have 4 children in the hostel there. We also saw the brilliant glass house extensions to the hostels and I have to say they were excellent. The children were playing in them and doing their homework and a great space has now been added to their hostel area. We met with our children and gave them their gifts from their sponsors, and it is always so good to see them smiling and flourishing. We visited Sindh Public school which is a day school. We sponsor 5 children there and again it was lovely to see the children and how they had grown since my last summer visit. Next was Lamdon Leh school where we spent some time visting the hostels and chatting with the principal and a visit to the classrooms where we met with a few of our children in their lessons. We sponsor 8 children here. Out next school was Jamyang School and it was the first time I personally had visited this school. It was set up by His Holiness the Dalai Lama. We had a new sponsored boy here who I was to meet for the first time. What a delight he was! He was happy to see us as we returned a couple of times to give him some clothes. We sponsor 3 children here. We had only a quick visit to Druk Padma Karpo school where we sponsor 4 children, but I only saw one to take her some gifts from a sponsor in the UK. She is now 13, but I have known her since she was 5 years old and she has grown up so much and has become more confident. We took the bus to Tingmosgang which is an experience in itself. We were headed for Tingmosgang Nunnery to deliver a large box of school books, pens, pencils, rubbers and sharpeners which Gill bought in Leh with the retirement money that her school gifted her. We met with the small nuns who go to school there. They range from 5 to 15 years. It is always fun here singing with the girls and they particularly love to sing ‘she’ll be coming round the mountain when she comes’! Our bus left at 9.30, so we sadly said goodbye and headed back to Leh on the packed music playing bus. 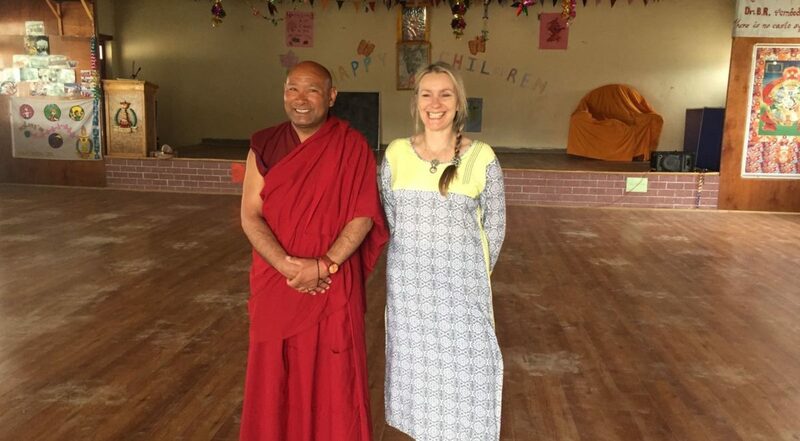 Rinchen Dolkar is my friend and our contact in Leh – we couldn’t run the charity without her! One of her children, Kunsal, has attended Taunton International School and we had arranged to meet with the principal of the local school she attends, which we had previously visited briefly. We met at his home for tea and Mary explained to him about Kunsal’s experience at Taunton International School. This trip was quick but productive and so special to share it with Mary, Gill and Laura. I hope they enjoyed Ladakh and its special people. I will return in September to see the children and pay the fees and collect receipts …. any excuse to return quickly!! Just to add, these trips are completely self funded by all of us who visit. A massive thank you to Rinchen and her family for putting us up in their home, and who continue to support me with Himalayan Children.